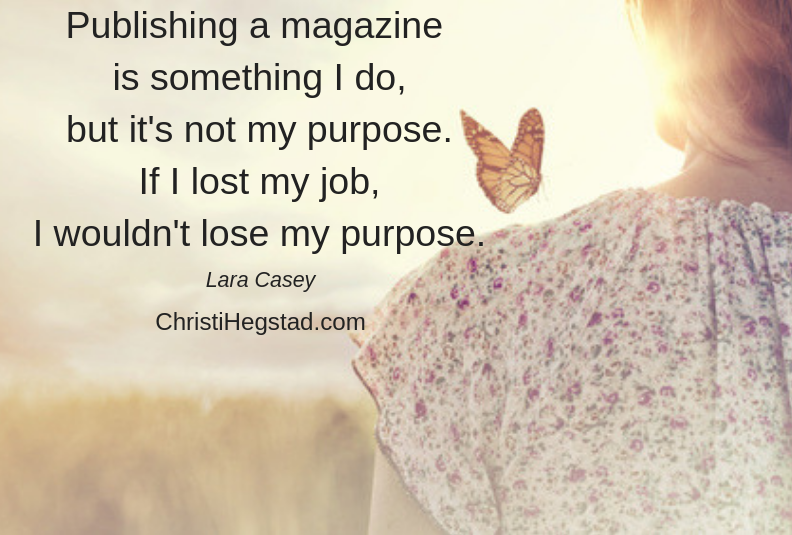 Your job, family status, or leadership role does not equal your purpose. Start digging deeper for the through-line between them all. If I asked you, “What’s your purpose?” – how would you respond? We often immediately think of the roles we serve as our purpose: To be an inspiring CEO, a compassionate parent, a confident team leader. Yes, your purpose is like a through-line among your various roles. But if your role disappears or changes, you do not lose your purpose. Your purpose runs soooo much deeper than that. Notice moments that light you up, energize you, put you in a state of flow. Acknowledge when you feel strong or like you’re doing exactly what you are meant to do. Start making note of these ‘purpose clues’ in your journal and see what common threads you find. Seek examples in work, parenting, conversations with friends, while learning a new craft or skill, everywhere – and start to envision how your purpose shows up in them all. Commit to making 2019 your most positive, purposeful year ever! Join us here for weekly tips, read in 2 minutes or less, that will help you craft your most positive and purposeful year!